Direct response. Marketing collateral. Print ads. Digital or web copy. White papers. B2B. B2C. Trade. Internal communications. You need a freelance advertising or marketing copywriter who can get the job done — and done exceptionally well. Perhaps you’re an advertising or marketing agency, or design firm, and your in-house creative staff is swamped. Or you’re an international brand that needs an integrated marketing campaign. 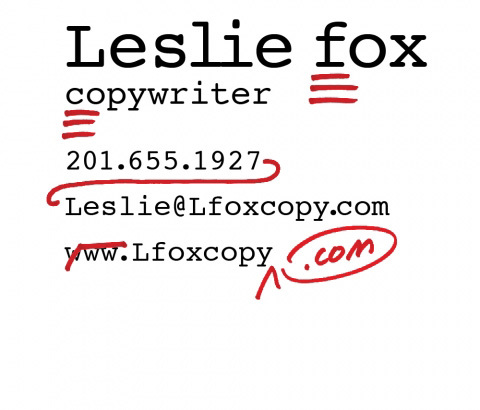 Maybe you’re a start-up that needs a freelance SEO copywriter to write your website content. Or a small or medium-sized business with a one-off need for a brochure, video, or direct mail campaign. Whatever your project or industry — from travel, banking, retail, and insurance, to technology, real estate, and manufacturing — Leslie Fox brings a great deal of experience to the table, with an extensive portfolio to prove it. Get your copy of “9 Things to Look for in a Copywriter” today. Simply complete the form below. Your info will not be shared with anyone.